Does anyone actually read these? Are you really, really, reeeeeaaaaalllllyyyyyy desperate to know about me? I bet you’re not. In fact, I’m sure of it, but years of Pavlovian self-conditioning and your pointer finger knew instinctively how to screw you out of the next five minutes of your life. I say just go with it, as I often do when trapped in these situations. Shrug your shoulders with a, “Well it happened; I’m here what could go wrong?” kind of attitude. Either way you’re safe; I will have no idea whether you read this or not, only possibly when we meet face-to-face and then all bets are off. I’m writing this tucked away in my studio being assaulted by the noise of dueling leaf blowers in my neighbor’s yard. There are two things you can deduce from my sharing this with you. I live on Long Island and hate noise pollution. I do, however, enjoy some good old-fashioned visual pollution. We’ll get to an explanation of that in just a minute. I didn’t truly begin my visual-arts career in earnest until I was in my late twenties. Girly fantasies, starry eyes and wishful thinking lead me into a maze of dead ends. 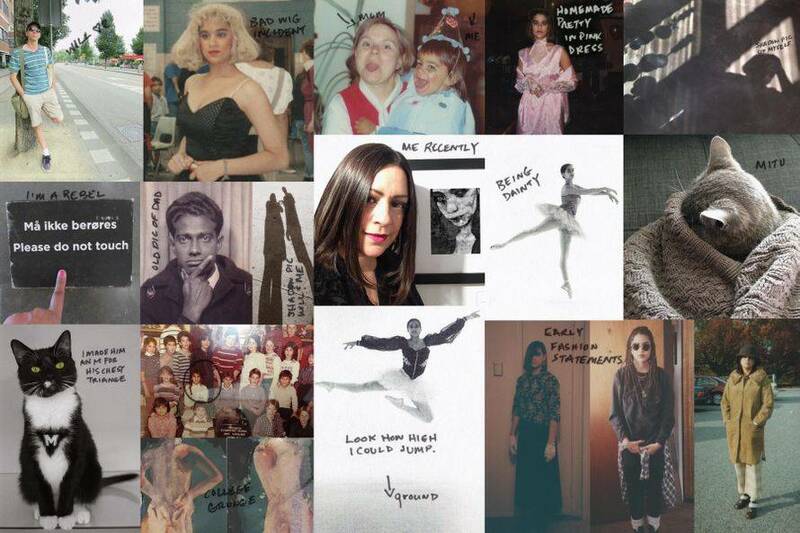 I spent eleven years as a Russian-trained classical ballet dancer. That ended abruptly when I realized that I was going to starve to death because no short, half-Indian, giant-boobed girl was ever going to really make it in the dance world. My cheerleader and ever-optimistic mom saw things differently, however, and thought my dance abilities would parlay nicely into a career in musical theater. So, I sang, acted and danced my way into discovering I hate musicals. It didn’t help either that during my time spent in the THEE-ATE-HER I had a really bad encounter with a blond wig. However, out of my musical misery came a one-year stint as a costume designer before the age of 17, which foolishly lead me to believe I could somehow become involved in fashion. That lasted one Molly Ringwald Pretty in Pink look- alike dress and one semester in fashion at FIT. I mean I was comfortable messing with my own look, but certainly was not interested in curating anyone else’s. I wasn’t itching to go home after my fashion failure and figure out the rest of my life. I did the next best thing and took a winterm photography class entitled Print of Photo or something to that effect with the infamous Joel Aronson. Gotta give that guy credit for launching my visual arts career. I looked him up and he’s still going strong. Good for him. Maybe I should let him know how things turned out. In all seriousness taking that class was a turning point for me. You could produce images rather quickly and I understood it without having to overcome insurmountable mental obstacles. It satisfied the instant-gratification center of my brain and seemed to circumvent the learning disabilities with which I learn later on I had struggled with for years. As I continued on my photographic journey I realized I particularly loved messing around with experimental photographic techniques, like Polaroid transfers, acetone prints, cross-processing, collage and painting on top of prints. Also, anything considered toxic by today’s standards was always an invitation to participate in artful debauchery. Dangerous perhaps, but man those chemicals made cool stuff. The grungier, grainier and messier the images came out, the happier I was. This didn’t jive well with my professors or peers at FIT, who strived for glossy, in-focus, advertisement / fashion style perfection. I escaped this perceived tyranny via the streets of New York City. I fell in love with all the street art and graffiti you could find in the dirty parts your mother warned you about. There around corners and on dilapidated buildings were different brands of artists putting it all out there, letting time and passer-byes defile and manipulate the work, transforming it into something more beautiful and interesting with each passing day. At least in my eyes. Today, street art is big commerce and sought after, but back then you were a sinner for appreciating that sort of thing, let alone calling it art, despite the likes of Jean-Michel Basquiat and Keith Haring. It’s like you had to go to an official art museum to cleanse your eyeballs and relearn the establishment’s idea of proper art. Don’t get me wrong, visiting an art museum is my version of church, but I always return to the street for a lot of my inspiration. It was a blast back then, running with a small crew who left their temporary mark proudly, with elation, no regrets. I loved adding visual pollution in-between all that “respectable” imagery. In between then and now life happened. I acquired a second degree, had a twelve-year career as a studio photographer and master darkroom printer, became completely absorbed by the digital-art realm, segued into graphic design and illustration, attained a third degree, suffered massive, intense and complicated personal losses, spent years in limbo, procreated my inevitable rebirth, launched a continuing respected teaching career, developed a stable and authentic relationship with my best friend and hubs, Will, and have two furry assistants Mitu and Milo. I’m just now settling in. I’m still fidgety, unsatisfied, disgusted with our world at large, get overly excited over silly things both good and bad, am able to recognize underappreciated good deeds and acknowledge overlooked magical and delightful oddities that abound. I’ve mellowed a bit, but I hope not too much. So there I am in a nutshell. Now walk away from your electronic device slowly and fill your head with glitter, unicorns, rainbows, dancing hula girls, cookies and lollipops. Let’s try and pretend this never happened.